Minor League Player of the Day: Leadoff hitter Juan Silva reached all five times he came to the plate and scored three times. He finished the day with a triple, a homerun, two walks, and was hit by a pitch. Yohan Pino struck out 10 batters over 6.2 innings. All three of the runs were his (two earned) on 5 hits and 3 walks. No Louisville player had more than one hit, but Josh Fellhauer was 1-for-4 with a BB, an RBI and a run scored. Josh Smith allowed just 2 runs in six innings on 7 hits and 1 walk. Ryan LaMarre was 2-for-4 with a solo homerun and two runs scored. Mike Dennhardt allowed 4 runs, 8 hits, and 1 walk in 5.1 innings, while striking out 4. Jake Johnson didn’t allow a hit or a walk while striking out 2 over the final 2.2 innings. The Blaze pounded out 19 hits and everyone contributed to the offensive outburst. Leadoff hitter Juan Silva (2-for-2, HBP, 2 BB, 3B, HR, 3 runs) reached all five times he came to the plate. Jackson Stephens allowed both runs in his 3.2 inning start. He walked 2 and struck out 4. Joe Hudson doubled and then scored in the 3rd inning for the Dragons’ lone run. Sal Romano allowed 4 runs, 4 hits, 5 walks and struck out 4 over 4 innings. Adam Matthews went 2-for-3 with a grand slam and two runs scored in his Midwest League debut. 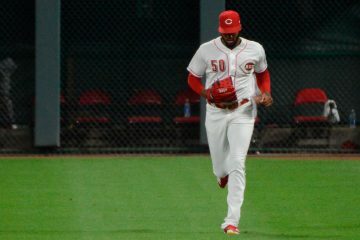 Amir Garrett allowed 2 runs (1 earned run) on 3 hits, 4 walks, and 3 strikeouts over 5 innings. Jose Ortiz was 2-for-4 with 2 homeruns and 4 RBI. Michael Lorenzen made his professional debut, pitching in just the first inning. In his inning of work, he struck out a batter, allowed one hit and one unearned run. Junior Morillo pitched the next 5 shutout frames, allowing just 3 hits, no walks, and striking out 5. The only run came in the first inning on an RBI double off the bat of Aristides Aquino.